Annual DIGITAL Subscription / $40.00 U.S. The Journal is published semiannually in the spring and fall each year. Annual PRINT Subscription / $48.00 U.S. The Journal is published semiannually in the spring and fall each year. Each subscription includes the current issue plus the next available issue when published. Digital Access - You are notified by email that the new issue has been added to your RedShelf library. Print Option - You receive the next available issue in the mail. 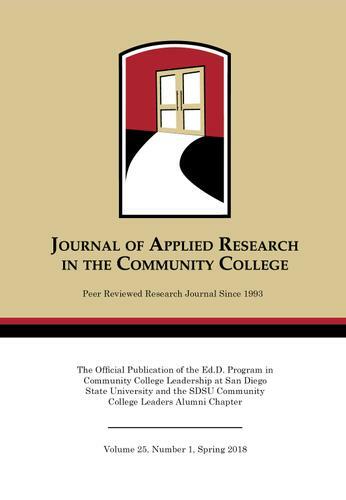 Since 1993, the Journal of Applied Research in the Community College (JARCC) has served the institutional research and planning professionals in community colleges. We are now expanding that focus to include feature articles relating to the integration of research and theory to practice in all aspects of community college education. This semiannual, peer-reviewed journal provides an intellectual space to communicate innovative practices that support educational decision-making at the institutional, state and national levels. JARCC is published by the San Diego State University Ed.D. program in Community College Leadership and Community College Leadership Alumni Chapter.